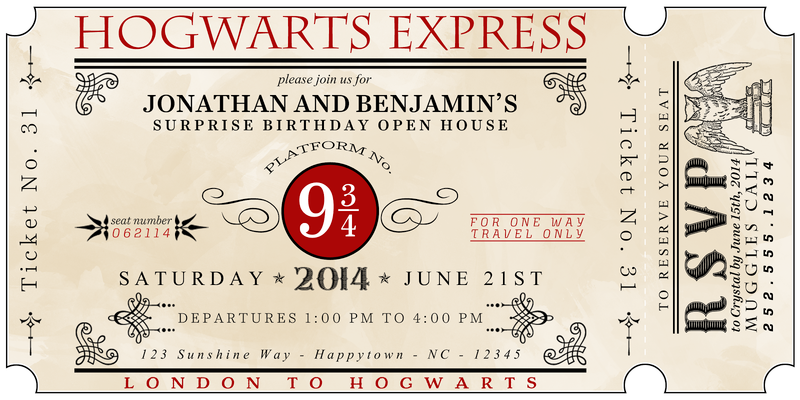 For our Harry Potter party invitations, I was inspired by many ticket invitations I came across during my idea search. In the end, I created our ticket to be printed onto a parchment-style card stock. Originally, I though I might print them on plain white card stock, so I created a colored parchment-style background. I now have custom printable invitations available in my Etsy shop. Click here to see them! I will customize a PDF with 3 tickets per page with all the details for your party or event. Then you can print as many as you need either on white card stock or on parchment or other specialty paper. Those are awesome, Thx! I'll have to try it out. I'd found and fell in love with the completed image a week or so ago, and intended to use it, but I can't thank you enough for doing the hard work that I thought I would have to do myself. What you left me with will be quite easy to use. I can't thank you enough! I don't suppose you'd like to share which fonts you used, or considered? "Font Quest" is next on my to-do list. Hi! Thank you so much for the lovely templates! I was wondering which font you used for the 'RSVP' and '2014'? Hi Amy! I'm thinking that the font is Sunday Best plain engraved. Thanks!!!! I love this~you're awesome to share! thanks so much, this is perfect! I can't save the file. Can someone give me instructions on how to save it? I did right click, save file as. That allowed me to download to my desktop. Hope that helps. Thanks! Made great party invites for my 9 year old! I need to send this electronically to a few people. How can I save this with just the front ticket image? I used the parchment looking template. Hi Sara! Once you have saved your finished page as a JPEG, you should be able to crop it down to only include the one ticket you've chosen to use. Just received my order, 2 days after I ordered! Cannot thank you enough for the expediency in which these were received..I'm going to have one happy little girl! !